Trick or treat? More like getting tricked by treats! Watch out for candy and soda dressed up as health food. Boo! Since Halloween is this week, it’s a good time to think about what makes this holiday so scary. It’s not the ghosts or zombies that come to your door in the evening seeking candy that you should be scared of, though. In fact, you don’t even need to wait until dark to get spooked. You are likely to see the scariest costumes on your breakfast table on Halloween morning—candy and soda dressed up as healthy food! Most people would consider yogurt to be a healthy breakfast. And it is, provided you aren’t getting tricked! Low-fat and fat-free flavored yogurt is almost always sweetened with sugar. This is true for the yogurt tubes that kids love and much of the Greek yogurt that is so popular. Sure, it contains protein and beneficial bacteria, but the added sugar makes it equivalent to frozen yogurt or ice cream in terms of calories and sugar . Some of these yogurts even come with toppings, like bits of chocolate, just like fro-yo! A healthier alternative is plain yogurt with real fruit. Sure, it’s not as sweet, but you will be getting the benefits of eating yogurt without all the added sugar. Many popular breakfast foods targeted at children include sugar-sweetened cereals, pastries, and bars. Some breakfast bars and cereals that seem healthy are really candy bars in disguise. Some even skip the disguise and actually look like candy or dessert. Pop Tarts and some granola bars are covered in chocolate or frosting, and favorite cereals often contain marshmallows or are shaped like cookies. No surprise that these foods are as high in calories and sugar as cookies or some candy bars. Worse, a child who is used to breakfast or snack foods that taste like candy or cookies may resist real food when it is offered. Now that’s scary! When you think you are eating something healthy but it’s really not—I call this Candy and Soda for Breakfast. And it’s not just breakfast, it happens at every meal. While the focus here is on food for kids, it really isn’t much different for adults. Breakfast foods like donuts and pastries are almost always topped with icing and it would be difficult to distinguish many muffins from cupcakes. For many people, coffee isn’t just coffee anymore, but a drink that contains as much sugar and as many calories as a milkshake, sometimes with whipped cream on top. What’s really scary is that this is how many people eat every day. As a general rule, steer clear of foods that look like dessert. Frosting, marshmallows, chocolate chips, and sprinkles simply aren’t part of a healthy meal! If you are worried about the big bags of candy that get brought home on Halloween night, keep this in mind. While eating a lot of candy is never healthy, a typical Halloween candy binge lasts a few days, after which time the candy is gone or the kids are literally sick of eating it. The long-term effects on your kid’s health (and teeth) can be offset by a good diet, regular activity, and diligent brushing and flossing. The same applies to you, too, if you find yourself digging into the big bowl of candy that is inevitably left over. Too fat to fly! Weight loss tips from the North Pole. There is a problem at the North Pole! Santa’s reindeer are unable fly, putting his Christmas plans in jeopardy. It turns out that the reindeer are suffering from a common problem, one that you might be dealing with, too. Fortunately, Santa has a solution that can help his reindeer and save Christmas. This is the topic of my Health & Fitness column in the Aiken Standard this week. According to the children’s book Too Fat to Fly by Doreen Belleville, Santa’s reindeer have gained weight in the “off season.” Too much sitting around and too many snacks and treats have resulted in weight gain to the point where the reindeer simply can’t do their job. Sound familiar? Whether it comes during the holidays or gradually throughout the year, weight gain is common for many people. And, like the reindeer, it often goes unnoticed until it is too late—trying to fit into your old suit or favorite dress, for example. It’s not just the weight that is the problem. The long, lazy vacation has allowed the reindeer to become unfit. They simply aren’t strong enough and don’t have the endurance to pull Santa’s sleigh. Again, a decline in fitness over time is something many of us experience and we may not notice it until we do something strenuous that makes it clear we are out of shape. In the book we learn that the solution is both simple and well-known. Santa charges his elves with getting the reindeer back in shape, in terms of both fitness and fatness. The snacks are replaced with healthy meals containing lots of fruits and vegetables. And days spent lying around are now spent in the gym and going for walks outdoors. Like many of us, the reindeer have a tough time adjusting to their new exercise routine. The treadmills are tricky for them, until they get the hang of it. For many of us, exercise equipment and new types of exercise can be intimidating. But with some guidance from the elves (or a personal trainer) you may find that trying new forms of exercise can really help you, just like it did for the reindeer. The reindeer followed a diet that emphasized fruits and vegetables. Despite the controversy over which diet is the best, almost everyone agrees that more fruits and vegetables and fewer calories from added sugars will help you lose weight. These foods are lower in calories than many other options, contain fiber to help you feel full, and replace less healthy foods you might otherwise pick. Carrots and apples, what the elves picked for the reindeer, are excellent choices, but pretty much any fruits and vegetables will work. Of course, you should eat other foods in moderation, too, including whole grains, meat, and dairy. The good news is that the diet and exercise program helped the reindeer lose weight and get back in shape in time for Christmas can work for you, too. While you may not see such rapid results, if you are careful with what you eat and dedicate time every day for exercise, you can lose weight relatively quickly. It’s not easy for people or for reindeer, but weight loss and improved fitness are achievable. Looking forward, continuing to eat a healthy diet and exercising regularly can save you the trouble of trying to lose weight next year at this time. It is always easier to maintain weight and stay fit than it is to lose weight and get back in shape. I’m sure that’s a lesson Santa will teach his reindeer! Boo! It’s the attack of the Halloween candy! Today marks the end of several days of Halloween events and celebrations. But even after the lights in the jack-o-lanterns have been extinguished and the costumes have been packed away, the Halloween horrors continue. It’s not the ghosts or witches or black cats you need to worry about, though. It’s the candy. And not just the candy that gets brought home by (or is left over from) trick-or-treaters. What you really need to worry about is the candy that remains, either in the cabinet or in the dish on the table. This is the topic of my Health & Fitness column in the Aiken Standard this week. If your home is like mine, you have probably been accumulating candy for several days now. Despite our best intentions, most of it will get eaten, probably in the few days after Halloween. There are several ways in which a Halloween candy binge could be bad for our health. First, it can add up to a lot of calories, which could contribute to weight gain. As a rough estimate, a typical “fun size” candy bar has about 75–100 calories. Look in your kids’ candy bags or the bowl of leftover candy at your front door and think about how many calories that adds up to. 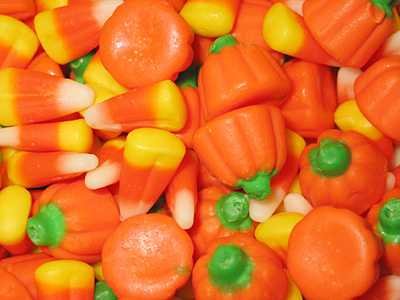 Second, eating lots of candy could replace healthier foods. Candy is considered “empty calories,” meaning that there is little nutritional value beyond calories—typically no vitamins, minerals, or fiber. And if you eat less at meals because of the extra candy you are consuming you may not be getting enough essential nutrients. However, since the candy binge will probably only last a few days, this shouldn’t cause long-term health problems. Third, the high sugar intake can contribute to cavities. Bacteria in the mouth produce acid when they come in contact with sugar, and this acid erodes tooth enamel to cause cavities. Sticky candy like gummies or hard candies that are in the mouth a long time are of particular concern. Obviously, brushing after eating can reduce the risk of cavities and chewing sugarless gum may help, too. Many parents try to reduce some of these potential health concerns by limiting how much candy their children can eat at a time. This makes sense since spreading out the candy consumption—a few pieces each day—means less sugar intake at any one time. Others solve this problem by letting their kids eat as much candy as they want on Halloween, then taking the rest away or letting their kids keep just a few pieces. Many times kids don’t even miss the candy when it is gone. This is probably a smart approach, but it does require some creativity to get the candy away. Replacing the candy with books, toys, or other gifts might help. For many people, the real problems begin after Halloween when the leftover candy ends up in a bowl at home or in a dish on a desk at work. While there are some people who can resist reaching into the bowl, most of us can’t. It’s just too tempting to grab a piece of candy as we walk by, and we likely do it more often than we think. In fact, sometimes the candy dish is set out for the purpose of getting rid of the candy! As the end of the Halloween candy season nears we will probably find ourselves eating more candy than we should. The good news is that as long as we get back to a routine of healthy eating and regular exercise, a Halloween candy binge shouldn’t do any lasting harm our health.